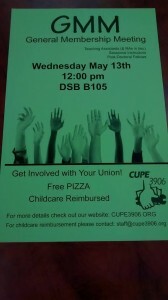 Our May General Membership Meeting will be held on Wednesday May 13th at noon in DSB B-105. Pizza and childcare (on request) are provided. We have some important items on the agenda, including a detailed benefits report and update, a campaign update on mental health services at McMaster, and the election of two trustees (needed to perform a yearly audit of the union’s finances). We hope to see you all there.